In SN2 reactions, the side opposite the leaving group, which is where the nucleophile attacks. Back-side attacks can happen for two main reasons, (1) High Electron Density and (2) Molecular Orbital Theory. (1) High Electron Density: Lone pairs create regions of high electron density, which blocks the entire front side of the respective compound. In effect, the nucleophile can not attack from the front, and is forced to attack from the back. (2) Molecular Orbital Theory: The key point here is to understand the flow of HOMO and LUMO, from nucleophile to the electrophile respectively. If the nucleophile attacks from the front, it encounters a barrier, in which there will be no net overlap between the HOMO and the LUMO. 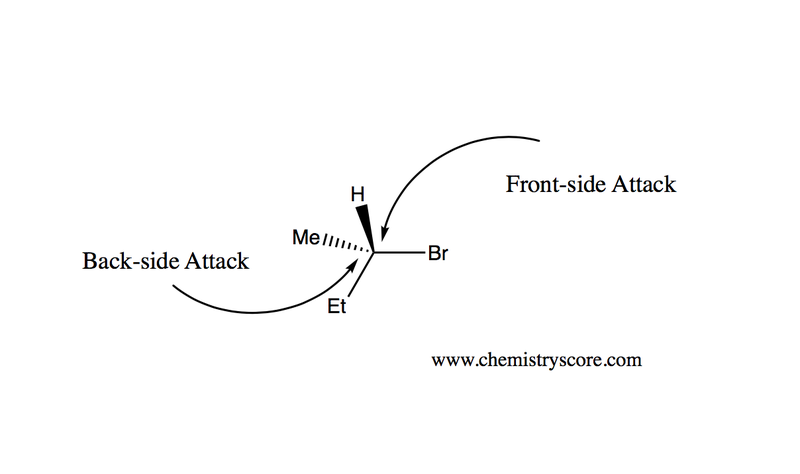 However, an attack from the back side allows for an efficient overlap between the nucleophile and the electrophile.